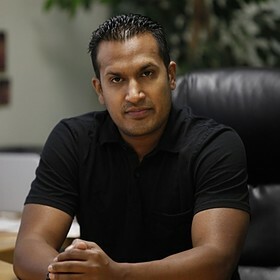 Praveen Chandra is CEO and founder of business called Wireless One, Inc.
Praveen Chandra as a successful business man also is an investor owner of Hooters and Icon Night club Downtown LA. He is not only busy all the time with his business deals but also actively participates in various activities and programs. His hobbies are to travel around the world, participating in various sports such as basketball, tennis, and golf. He also loves to watch and attend sporting events such as the Lakers, Clippers, and Denver Broncos games. With the support of Malibu Hindu temple located in Malibu California, he participates in charities too. Also he actively participates in Soup Kitchen located in Downtown Los Angeles on Saturday mornings.